The sermon preached at the 11am Service on 25th January 2015 in Dunfermline Abbey by the Assistant Minister, Dr Jean Kirkwood is online now. Read more"Remember O thou man"
Well done to everybody who knitted and donated knitting for the 2014 Labour of Love appeal. 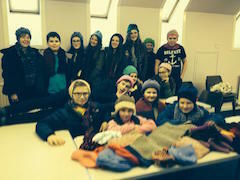 Here is the Abbey Youth Group modelling and counting some of the work. Read more"2014 Labour of Love Appeal"
The sermon preached at the 11am Service on 18th January 2015 in Dunfermline Abbey by the Minister, Rev MaryAnn R. Rennie is online now. The sermon preached at the 11am Service on 11th January 2015 in Dunfermline Abbey by the Assistant Minister, Dr Jean Kirkwood is online now. Read more"The Triune God is a God of love"
Robyn Smith from the Abbey Youth Group sings the beautiful carol “Infant Holy, Infant Lowly” at the Nativity Service in December. 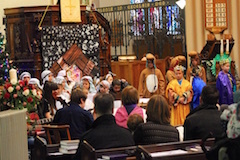 Read more"Infant Holy, Infant Lowly"
The sermon preached at the 11am Service on 4th January 2015 in Dunfermline Abbey by the Minister, Rev MaryAnn R. Rennie is online now. Read more"Journeying with the Magi"